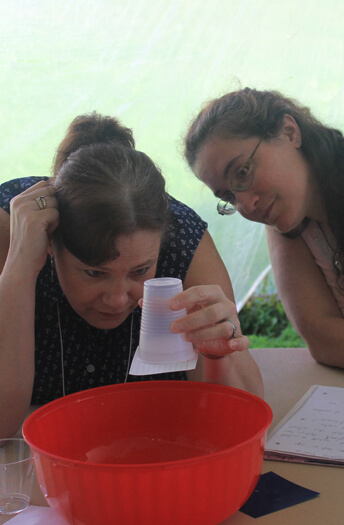 Mission: The Science Education Institute supports K-12 educators in teaching science more effectively by providing professional development to individual teachers and school districts with the goal of improving K-12 science education in New Jersey. Our current focus is to support New Jersey school districts with the implementation of the Next Generation Science Standards (NGSS). We provide a series of eight one-day workshops during the school year and week-long Institutes during the summer. We also work with school districts to develop a long-term professional development plan consisting of 3-5 workshops spread out over 1 - 2 years. The vision behind the Next Generation Science Standards (NGSS) is to provide students with the knowledge and skills so that later in life life they can use science to make sense of the natural world outside the classroom. NGSS-aligned lessons are driven by natural phenomena (observable events). Students learn how to use Crosscutting Concepts to guide their thinking about these phenomena. They engage in Science Practices and use Core Ideas in science to investigate how and why these natural phenomena occur and support their explanations with arguments. In addition, the NGSS requires that students engage in Engineering Practices to define engineering problems and develop, test, and optimize solutions for them. During the 2019-2020 school year, the Science Education Institute will be offering multiple professional development opportunities to support teachers and supervisors with the implementation of the NGSS. We recommend sending leadership teams of 3-7 teachers to at least three one-day workshops or the Summer Institute to develop a solid foundation for the NGSS. Dates, online registration, logistics, and detailed information about these professional development offerings are provided below. Workshops Cancellation policy: If you are unable to attend a workshop for which you are registered, we ask that you let us know as soon as possible – but within five (5) business days. Cancellations received within less than five (5) business days from the date of the workshop will not be eligible for a credit or refund and will be billed. We appreciate your cooperation and understanding. The workshops are led by Dr. Wil van der Veen, a nationally recognized expert in science education and a member of the New Jersey State Leadership Team for the NGSS. Participants will work in small groups that are facilitated by experienced classroom teachers from our NGSS Teacher Leader Program. For more information contact Tina Gandarillas at tina.gandarillas@raritanval.edu or 908-526-1200 x8942. Practices and Crosscutting Concept Focus: Develop understanding of all Practices and Crosscutting Concepts and how they mutually support each other; Using Science and Engineering Practices and Crosscutting Concepts to develop Performance Tasks that can be used for instruction and assessment. 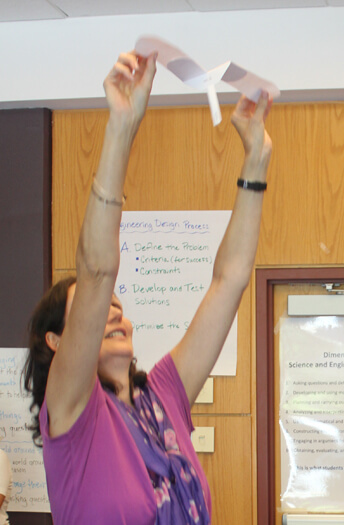 The week-long Summer Institutes are designed to support teachers and supervisors with the implementation of the NGSS. These Institutes are based on what we are learning about NGSS implementation through our work with teachers in New Jersey and across the nation, and are updated each year to reflect best practices. The Summer Institutes provide an immersive experience with the vision behind the NGSS and its three dimensions: the core ideas, the practices, and the crosscutting concepts. Participants engage in NGSS-aligned investigations to experience how Practices, Crosscutting Concepts, and Core Ideas are meaningfully integrated in instruction and assessments in physical science, life science, earth science, and engineering. Every day there will be multiple opportunities for reflection and structured time to plan NGSS-aligned lessons. This one-day workshop is designed to support teachers and supervisors with the implementation of the Next Generation Science Standards (NGSS). Participants will engage in NGSS-aligned investigations that are driven by natural phenomena in a variety of science content areas to deepen their understanding of NGSS Practices, Crosscutting Concepts, and Core Ideas. Although participants will experience a variety of Practices and Crosscutting Concepts, the main focus will be on the ones listed above and how they mutually support each other. Participants will learn how to use Crosscutting Concepts to frame questions for class discussions and to focus student thinking about natural phenomena. They will take away strategies to help students define systems related to the natural phenomena they are investigating. Specifically, they will investigate how to trace the matter and energy into, within, and out of systems, and consider how these systems are changing, and on what scale. Participants will experience and reflect on how Practices, Crosscutting Concepts, and Core Ideas are meaningfully integrated in instruction and assessments using Performance Tasks. There will be time for reflection and to plan NGSS-aligned lessons. This one-day workshop is designed to support teachers and supervisors with the implementation of the Next Generation Science Standards (NGSS). Participants will engage in NGSS-aligned investigations that are driven by natural phenomena in a variety of science content areas to deepen their understanding of NGSS Practices, Crosscutting Concepts, and Core Ideas. Although participants will experience a variety of Practices and Crosscutting Concepts, the main focus will be on the ones listed above and how they mutually support each other. They will take away strategies to support students as they analyze and interpret data to investigate the natural systems that cause these phenomena. They will learn how to represent these systems using a variety of models to explain these phenomena. Participants will experience and reflect on how Practices, Crosscutting Concepts, and Core Ideas are meaningfully integrated in instruction and assessments using Performance Tasks. There will be time for reflection and to plan NGSS-aligned lessons. This one-day workshop is designed to support teachers and supervisors with the implementation of the Next Generation Science Standards (NGSS). Participants will engage in NGSS-aligned investigations that are driven by natural phenomena in a variety of science content areas to deepen their understanding of NGSS Practices, Crosscutting Concepts, and Core Ideas. Although participants will experience a variety of Practices and Crosscutting Concepts, the main focus will be on the ones listed above and how they mutually support each other. They will take away strategies to help students construct and write explanations and support them with arguments for how the evidence supports the explanation. They will learn how to establish norms and use strategies to ensure productive classroom discussions and respectful arguments and how to help students support claims with evidence and/or reasons. Participants will experience and reflect on how Practices, Crosscutting Concepts, and Core Ideas are meaningfully integrated in instruction and assessments using Performance Tasks. There will be time for reflection and to plan NGSS-aligned lessons. Practices and Crosscutting Concept Focus: Using Practices and Crosscutting Concepts to develop Performance Tasks that can be used for instruction and assessment. This one-day workshop is designed to support teachers and supervisors with the implementation of the Next Generation Science Standards (NGSS). The first part of this workshop will focus on the explicit use of Core Ideas to write teacher-level explanations for natural phenomena. These can be used to define science content goals for instruction and assessments. The second part of this workshop will focus on writing Performance Tasks that meaningfully combine Practices, Crosscutting Concepts, and Core Ideas. These Performance Tasks will help guide and focus students as they investigate natural phenomena and they will prepare students for the NGSS Performance Expectations. Participants will use an extensive lesson planning guide and a nationally field-tested template to plan NGSS-aligned lessons and assessments. Content Focus: Increase familiarity with the night sky; increase familiarity with a range of projection cylinders in astronomy, earth science, and biology. Starlab is the prefect tool to make science come to life for students. It helps teachers implement aspects of the Next Generation Science Standards (NGSS) by allowing students to make observations, collect and analyze data, and construct explanations for natural phenomena in astronomy, earth science, and biology. Astronomical phenomena such as the daily and yearly motions of the Sun, Moon, planets, stars, and constellations are easily observed with Starlab. Data from these observations present students with the evidence to develop models and construct explanations for these phenomena. Starlab also includes cylinders related to Earth Science concepts such as Ocean Currents, Weather and Climate, and Plate Tectonics; and Biology concepts such as the cell. During this one-day Starlab training, participants will learn how to set up, maintain, and repack the Starlab system and become more familiar with the night sky and the many Starlab cylinders that are available. This training certifies K-12 teachers to rent one of our Starlab Portable planetariums. The NGSS Teacher Leader Program prepares educators to take a leadership role in New Jersey’s implementation of the Next Generation Science Standards (NGSS) by engaging in a variety of professional development experiences with colleagues from other districts. Through participation in this program, teachers deepen their understanding of all aspects of the NGSS while developing collaborative and leadership skills, with the ultimate goal of supporting NGSS implementation in their district. The program is a collaboration between the Science Education Institute at Raritan Valley Community College (RVCC), the Rider University Science Education and Literacy Center (SELECT), the Princeton University Teacher Preparation Program, and Leadership in Science, LLC. The NGSS present a research-based approach to improving and transforming science education, focusing on three intertwined dimensions of science learning: science and engineering practices, crosscutting concepts, and disciplinary core ideas. The NGSS is changing how science is taught and learned, creating opportunities for students to build deep understanding of science over time. Effective NGSS implementation requires that teachers make significant shifts in the content and manner in which they teach. This will require that everyone involved in the education system – teachers, administrators, and parents – thoroughly understand these shifts. To be successful, teachers will need significant and long-term support to embrace the instructional strategies that support student learning in the NGSS. Through their involvement with the program, Teacher Leaders are provided with multiple opportunities to co-facilitate the consortium’s professional development programs. These include the NGSS Summer Institutes and the NGSS Professional Development Workshop Series at RVCC, the CONNECT-ED program and an Engineering Workshop Series at Rider University, the QUEST Program at Princeton University, and a variety of in-district NGSS and leadership workshops provided by Leadership in Science LLC. To support their co-facilitation responsibilities, Teacher Leaders are provided with workshop designs and resources as well as mentoring and other supports. Teacher Leaders facilitate the learning of workshop participants and provide feedback on workshop designs. They share their own experiences with implementing the NGSS and assist workshop participants with lesson planning. This opportunity for Teacher Leaders to collaborate with higher education experts will build their capacity to support colleagues in their own school district. Support from school and district administration for participation as well as implementation of lessons learned in their district. How do I become a Teacher Leader? Participation in the program is by invitation. Teacher Leaders are selected based on the selection criteria outlined in the Program Description. Anyone who is interested in becoming a Teacher Leader is encouraged to submit a Letter of Interest describing their prior NGSS professional development experiences and classroom implementation efforts and arrange for a separate Letter of Support from a district administrator. What is the time commitment for participation in the NGSS Teacher Leader Program? The requirement is that Teacher Leaders participate in at least two workshops per school year (September 1 – June 30). They should expect to be out of the classroom a minimum of two days during the school year – or more if they choose. Teacher Leaders should discuss this with their school and district administrators. Most of our Teacher Leaders are out of the classrooms between 2 and 6 days per school year. There are also additional workshop opportunities during the summer. What is the Teacher Leader's home district's commitment in terms of release time during the school year and other resources? The district is responsible for subs when a Teacher Leader is out of the classroom (a minimum of 2 days per school year). There are no other costs or fees for the district. The regular workshop fees (typically $125 per day) are waived for Teacher Leaders. Do Teacher Leaders receive a stipend for participation in the program? Teachers Leaders will be paid a stipend of $50 per day for preparation during the school year. For workshops during school holidays or vacations (including the summer break) the stipend is $150 per day including preparation time. What is the duration of participation in the NGSS Teacher Leader Program? Teacher Leaders may participate in the programs for as long as they prefer and for as long as funding for the program is available; the program is not limited to one school year. Can more than one teacher per school district participate? We are currently expanding the program to include multiple teachers for larger school districts. Are science supervisors or principals eligible to participate in the NGSS Teacher Leader Program? The program is for classroom teachers. If a Teacher Leader accepts an administrator position after joining the program she/he will be able to remain in the program. How is the NGSS Teacher Leader Program funded? The NGSS Teacher Leader Program is currently funded by donations from the 3M Corporation, the Investors Bank, the PSE&G Corporation, and the Sanofi North America Corporate Social Responsibility. The NGSS move away from a science curriculum that is “a mile wide and an inch deep” to focus more on a limited number of core ideas. This allows students to develop a deeper understanding of important science concepts that can be used to explain natural phenomena (observable events) and solve engineering problems. Science and engineering practices and concepts that cut across all sciences, such as patterns or matter and energy, are critical tools for scientists and engineers. Research has shown that engaging students in these same practices and crosscutting concepts develops an integrated and deeper understanding of science. In addition, students develop skills that are critical in the 21st century, such as working collaboratively in groups; analyzing data and developing and using models; and developing critical thinking, a skill which has been shown to increase academic achievement across the board. Many of us may have wondered why we need to learn the science that is presented to us in school. The NGSS are the first standards that integrate science and engineering from kindergarten through grade 12 and go far beyond the typical egg drops or robotics classes. They are intended for ALL students and not a selected few. Not only will this help prepare our students at a time that most jobs require a background in science and engineering, it will also provide a motivation for why we have to learn the science in the first place. Starlab is the prefect tool to make science come to life for students. It helps teachers prepare for the Next Generation Science Standards (NGSS) by allowing students to make observations, collect and analyze data, and construct explanations for natural phenomena in astronomy, earth science, and biology. Astronomical phenomena such as the daily and yearly motions of the Sun, Moon, planets, stars, and constellations are easily observed with Starlab. Data from these observations presents students with the evidence to develop models and construct explanations for these phenomena. Starlab also includes projection cylinders related to Earth Science concepts such as Ocean Currents, Weather and Climate, and Plate Tectonics and Biology concepts such as the cell. Participants will learn how to set up, maintain, and repack the Starlab system and become more familiar with the night sky and the many Starlab cylinders that are available. To register for our Starlab Training on Wednesday November 28, 2018 click here. The training certifies K-12 teachers to rent one of our Starlab Portable planetariums. Our portable planetarium can bring the stars down to the Earth - and to your school! Starlab is a portable planetarium made of fabric, which is inflated by a fan and capable of accommodating approximately 25 students. A star projector recreates the sky, including the Sun, Moon and Planet positions on the dome, for any time or place on earth. Starlab is compact enough to fit into a small car and is easily set up in 15 minutes. It requires a clean floor space of 20' x 22' and a 12' ceiling. Any teacher who has attended an NJACE Starlab certification course is eligible to rent a Starlab. Our Starlabs are available for rent for $375 per week and $275.00 for each additional consecutive week. The cost includes the dome, blower, various accessories, Northern Sky and Greek Mythology cylinders and up to 4 additional additional optional cylinders. Teachers must pick up the Starlab at RVCC on a Friday between 9:00am and 4:00pm. Teachers may submit a request for their preferred pickup and drop-off times, and they will be contacted with information about whether those requested times are available. Please note that March, April and May are the busiest months for Starlab rentals. Please register early or consider renting at a different time. If you are interesting in bringing a Starlab to your school with a presenter, check out the Planetarium’s Starlab Outreach Program. Dr. Wil van der Veen is the director for the Science Education Institute since 2006. He has a Ph.D. in Astrophysics from the University of Leiden (The Netherlands). He has done research in astronomy for 20 years and has been involved in education since 1996. Tina Gandarillas is the Manager of Education Programs for the Science Education Institute since 2018. Between 2011 and 2018, Tina taught kindergarten at St. Ann’s school in Raritan. She has also previously taught 1st, 2nd and 5th grade in East Orange. In between her teaching jobs Tina was the director of Children Services at the Somerville Family YMCA. Mariel O’Brien was the Manager of Education Programs for the Science Education Institute between 2014 and 2018. She is currently still leading our Starlab trainings while she is pursuing a PhD in Physics Education at Rutgers University. She has a B.S.G in Astronomy and Mathematics of Villanova University and a M.A. in International Relations for Science and Technology from the Schiller International University in London, England. To support New Jersey school districts with the implementation of the Next generation Science Standards (NGSS) a consortium of three higher education institutions has been established: the Rider University Select Program, the Princeton University Teacher Preparation Program and the Science Education Institute at Raritan Valley Community College. Together, we have been planning for the implementation of the Next Generation Science Standards state wide and have designed a number of professional opportunities to support teachers' success in implementing the NGSS.